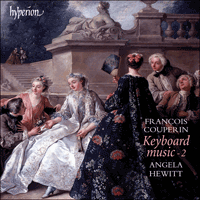 Angela Hewitt’s hugely successful first volume of François Couperin’s Pièces de Clavecin presented works from Books II and III of the cycle. Here we have a further twenty-one pieces, this time from Book IV. Critical acclaim for the first volume (Hyperion CDA67440) surely makes this new disc a self-recommending classic.